The services may be prayed individually, in groups, churches or in religious communities. Drawing on the daily Bible readings laid out in the Common Worship Lectionary, they allow Anglicans to link their personal devotions into the shared prayer life of the Church. As well as the more traditional services of Morning, Evening, and Night Prayer, Daily Prayer also offers Prayer During the Day, especially designed for those new to regular liturgical prayer. Each service contains the three key elements of praise, intercession and engagement with Scripture. Prayers are included for both Ordinary Time and the seasons of the Christian year. 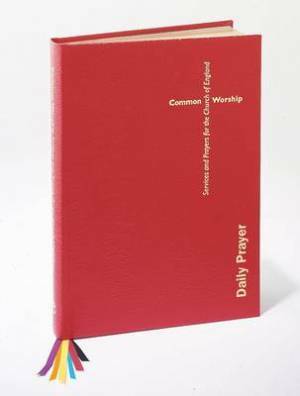 Common Worship: Daily Prayer by Church House Publishing; House Publishing Church was published by Church House in June 2011 and is our 1156th best seller. The ISBN for Common Worship: Daily Prayer is 9780715121993. Be the first to review Common Worship: Daily Prayer! Got a question? No problem! Just click here to ask us about Common Worship: Daily Prayer. Is Morning Prayer in modern/contemporary language in this book? A:Common Worship is mostly in modern language, though it retains versions of the Eucharist and other material in the language and using the structure of the Book of Common Prayer.